Focus on the Family needed to create a series of product informational kiosks for the Focus on the Family visitor center. A series of three kiosk programs were developed centered around the themes of Parenting, Love and Marriage, and Teens. 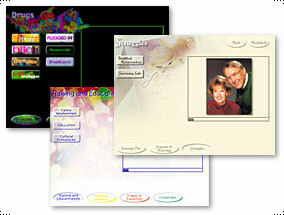 Each program was designed around it's theme giving the users a true sense of the topic they were exploring. Users were presented with topics of interest which would lead them down to product offerings in an informational and trusting manner enabling comfortable purchases from the visitor center itself.